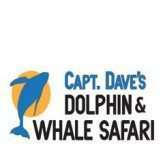 Aboard Captain Dave’s Dolphin and Whale Watching Safari there is never a dull moment, always a learning opportunity, and guaranteed a thrill. On our dolphin and whale watching trips you can be close enough to smell their breath! And we see whales and dolphins all year long. Our boats are safe, stable, and designed especially for you to get up close and personal with the awesome dolphins and whales of Southern California.